Things are starting to come together with the design and build of this new studio. 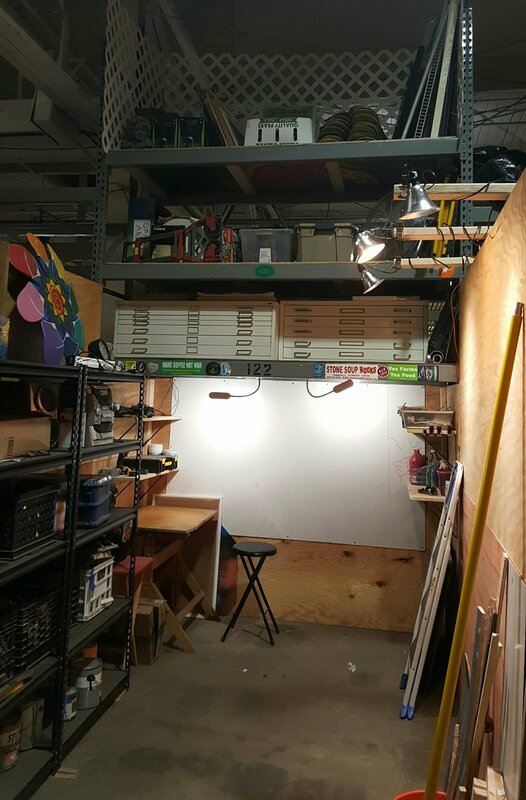 Located at The WorcShop, the largest makerspace in central MA, I am renting a section of a warehouse shop that I have converted into an art studio. Basically everything was designed and cconstructed by myself for about $500 (some supplies and tools I already had or sourced for free). I'm about 50 hours into the project so now seemed like a good time to share some progress. Full studio from the entrance. Wall for hanging works in progress. The white wall is a dry erase board for sketching. Since the floor space is only 8' x 12', I have to maximze functionality of this garage bay. I do this by creating accessible storage. Paints, tools, art materials are kept on the ground level. Canvas, frames, vending gear, and other gear is stored up top. The bottom shelf consists of flat files, which store paper, prints and canvas. 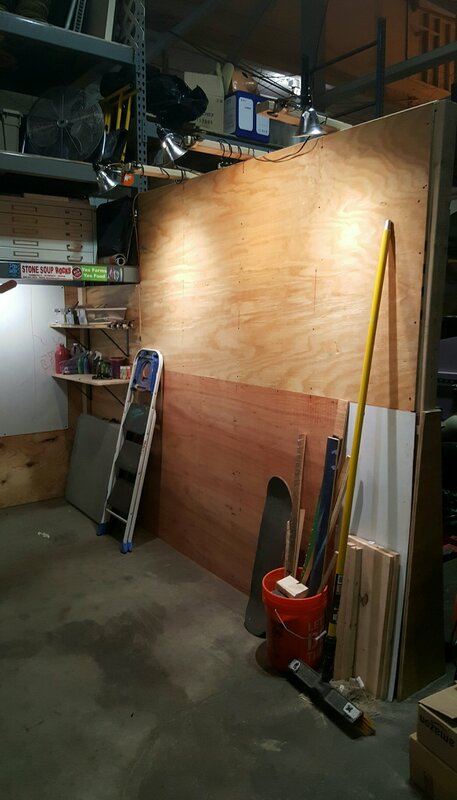 The next and final phase will include building a work table on wheels, adding colored and UV lighting, built in ladders for reaching upper shelves, and adding a curtain for 'closing and opening' the shop. Really loving the layout and flow of the space of far. The project so far has been extremely fun and challenging, forcing me to analyze my approach to making art. I'm excited to see how this atmosphere will influence the creative process. Finally time to break this studio in!